The consulting bible for setting up a world-class consulting business positioned for success from the get-go. Ordinarily, the consulting business is competitive, for a new consulting business, it is ultra-competitive; because to successfully break into a consulting niche, you need to go against already established consulting businesses. This task will be unduly difficult/impossible without the right information on how to setup and run an IT consulting business in the manner established businesses do for profit. Step-by-step guide to setting up an IT consulting business provides a hand-held guide to setting up an IT consulting business that will be instantly seen as professional and business ready. 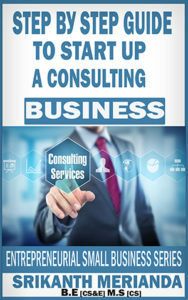 This book is an invaluable resource for any beginning IT consultant that wants to start a consulting business set for the highest possible returns in little time.